Ynys Llanddwyn has two lighthouses. Neither of which fit the classical design that we know today. 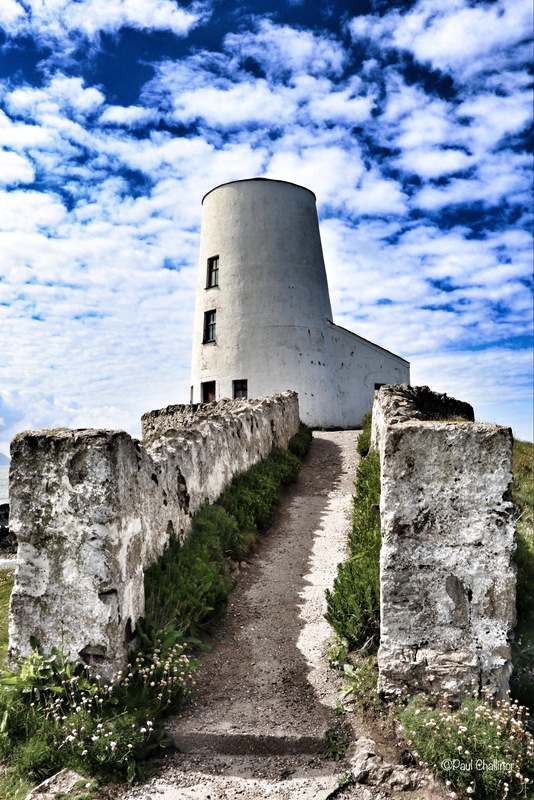 Twr Mawr (Big Tower) is more characteristic of a windmill than a lighthouse, and much can also be said of the smaller tower which now carries the light. The lighthouses cover the westernmost approach to the Menai Strait the narrow but treacherous water between Anglesey and the main land of Wales. The history of the lighthouses on Llandwyn is uncertain, but by 1823 it is certain that the two towers were already built, probably as day markers, but not with lights. In 1845 alterations were recorded as being made to Twr Mawr, costing £250 7s 6d, and a light was installed in 1846 (1). Twr Mawr is 36 feet (10 m) high and 18 feet (5.5 m) in diameter. It incorporated living quarters, but uniquely the light was shone from a lamp room at ground floor. South from Twr Mawr is another conical tower, also painted white, known as Twr Fach (Small Tower). This was built between 1800 and 1818 of rubble stone with a domed roof (1). In 1975 the light was moved from Twr Mawr to Twr Fach. This is now a solar powered light, monitored and maintained by Trinity House. The light is visible for 7 miles. Just across the small beach from Twr Fach is a group of small cottages. These housed pilots who would watch for boats approaching the western end of the Menai Strait. The pilots would then row out to guide them through the reefs and safely into harbour at Caernarvon and other ports along the coast. The cottages now act as offices for the nature reserve.